In 1847 when The Century club was founded—taking its name from the 100 invited members—Union Square was developing as a most fashionable residential district. The park was ringed with fine brick homes and churches which spilled onto the side streets; all except for East 15th Street where five industrial buildings created a stark exception. The five buildings were faced by two wooden homes across the street to the north, one being No. 42 East 15th Street. That two-and-a-half story house was purchased in 1855 by Isaac Lewis, a builder. Before long the house and the block would change dramatically. The club bounced from location to location until that year when it increased its membership to 250. With a permanent clubhouse now deemed a necessity, the Century purchased No. 42 from Lewis for $24,000. Club member and architect Joseph C. Wells set about to renovate the wooden house into a proper clubhouse. The $11,000 renovations resulted in a Cinderella-like transformation. The frame house became an Italian palazzo with a balustraded staircase and pedimented windows. Throughout the Civil War years the club continued to grow and expand its activities. The clubhouse, by 1866, was no longer adequate for its functions and meetings. A committee was formed to decide whether to move or reconstruct the building again. It was a time of financial uncertainty for exclusive men’s clubs. 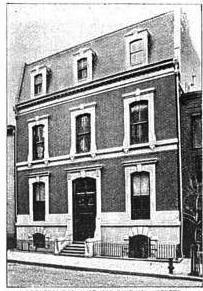 The eminent Union Club was reported to be “deep in debt” by The Sun and The New York Club had heavily borrowed to keep afloat. Before long both the Athenaeum and the Eclectic clubs would close due to financial hardship. Considering its finances, the Century opted to renovate. The partners in the architectural firm of Gambrill & Post, Charles D. Gambrill and George B. Post, were both club members. In May of the following year Gambrill submitted his proposal renovations. For some unexplained reason, part of Gambrill’s design—an extension to the rear of the clubhouse—was quickly completed; but the interior alterations and the new façade sat on the drafting table. The new extension provided for a billiard room on the main floor and an art gallery above. During the two years while the plans collected dust, Post left the architectural firm and Gambrill took on Henry Hobson Richardson who, like Post, would go on to be ranked among America’s preeminent 19th century architects. Finally in 1869 construction began under plans by Gambrill & Richardson. The amount of input Richardson had in the final designs is undocumented; but whichever architect was responsible, the result was noteworthy. Gone was the Italian palazzo with its stone balustraded fences and Renaissance-styled windows. In its place appeared a brick and stone neo-Grec structure with a formal countenance that reflected the propriety of the club members. The third floor attic was raised to form a full-floor mansard. Stone courses doubled as structural support and horizontal design elements. The completed renovations cost $21,000—nearly the full price the club paid for the building originally. The Century Association would see America’s brightest literary and artistic figures sign their membership rolls throughout the years. The unending list included actor Edwin Booth, artists Albert Bierstadt, Frederick Church, Charles C. Tiffany and Augustus Saint Gaudens. Politicians like Grover Cleveland, Theodore Roosevelt and Hamilton Fish were members, as were William Cullen Bryant, all three members of the architectural firm McKim, Mead and White; and millionaires John Jacob Astor, Jr., Cornelius Vanderbilt and J. Pierpont Morgan. By 1887 when the guidebook “How to Know New York City” called the Century Association "a literary, artistic, and aesthetic club, with…a large library, and a picture-gallery,” membership had grown to 600. That same year sculptor Auguste Bartholdi arrived in New York to help raise money for the pedestal of his “Liberty Enlightening the World.” The colossal statue had been presented to the United States as a gift from the people of France; however it might well have included a tag “base not included.” Bartholdi understandably chose the Century Association building for his January 2, 1877 fund raising speech. One year later, almost to the day, the Century, now with 800 members, took possession of its McKim, Mead & White-designed clubhouse on West 43rd Street. Before the end of the year The United States Brewers’ Association had taken over the old building. The Association put a spin on its product, asserting to Victorian morality that the drinking of beer reduced the indulgence in alcohol. “It is contended by the Association that the industry it represents is in the interest of temperance and morality, as its effect is to diminish the consumption of intoxicating liquors,” said the handbook. Unlike the Century Association before it, the Brewers’ Association had political goals on its agenda. In December 1898 a “congress” of brewers from across the United States was held to call upon Congress to abolish the war tax on beer. During the Spanish-American War both the saloon keeper and the consumer paid a tax to help offset war expenses. The Sun was more interested in the members than the purpose of the congress. When millionaires were mentioned, it was bankers and railroad moguls who came to mind. But many beer brewers had amassed enormous fortunes. “This will be the first time in the history of this or any other city where so many millionaires have gathered at one hall at the same time,” the newspaper predicted. It estimated the aggregate worth of the delegates to be over $400 million. It was just the sort of added stimulation the Prohibitionists were looking for, and 1901 saw increased activity in the Temperance movement. · A marked decrease in drunkenness has been noted as a result of the increased sales of beer. · Prohibition has gained little or no headway in New York State notwithstanding the persistent and continued activities on the part of the various prohibition organizations. · The traffic in alcoholic beverages pays an annual direct tax of nearly $20,000,000 to the State of New York in addition to other taxes; more than one-third of the entire State Budget. The advertisement did not work. In September 1918 the Fuel Administration issued an order prohibiting the brewing of beer after December 1. A meeting at the United States Brewers’ Association building was immediately called. The ramifications of the order were far-reaching. There were 9.673 saloons in the five boroughs. Their closing would mean tens of thousands of New Yorkers would lose their employment--there were at the time around 25,000 bartenders alone. The breweries had enormous reserve stocks of grain and other ingredients; not to mention the thousands of barrels of beer stored in gigantic tanks. Then, on January 16, 1919, the 18th Amendment to the Constitution was ratified prohibiting the “manufacture, sale, or transportation of intoxicating liquors” and on October 28 of that year the Volstead Act was passed to enforce the new laws. The Women’s Christian Temperance Union, the major player in the movement, had gotten its way. In doing so they left jobless “middle-aged and elderly men still in the business in which they have always worked,” as described by The New York Times. They also put an end to the United States Brewers’ Association. For some time the Interboro Mutual Indemnity Insurance Company, originally organized in 1914 as the Brewers Mutual Indemnity Insurance Company, stayed on in the building. Throughout the 20th century it saw a variety of uses. In the 1920s it became home to the Manhattan chapter of the Sons of Italy Hall, and in the 1930s the Galicia Sporting Club. Eventually No. 109-111 East 15th Street was occupied by the New York Joint Board of Shirt, Leisurewear, Robe and Sportswear Workers Union; then an Asian-American trading company that also ran a dry cleaning shop in the basement. In 1996 a year-long restoration and renovation of the building was initiated by Beyer Blinder Belle, transforming the former clubhouse into the Century Center for the Performing Arts. The new facility included a 248-seat theater, a studio and a ballroom. After a decade it was taken over as the New York City production facility for the world’s largest religious television network, Trinity Broadcasting Network. The company offers 24 hours of commercial-free programming aimed at Protestant, Catholic and Jewish audiences. With minor alterations (the iron cresting of the roof is gone, as are the entrance steps, and the basement windows are now doorways), the distinguished clubhouse is mainly unchanged. It was designated a New York City landmark in 1993.